On August 8th, on our 85th dive, we finally entered the water complete with our video system. That’s the good news. The bad news is we made 84 dives without this critical type of documentation. The other bad news is despite assurances by Sony that the camera had undergone tests and been found in perfect working order, the automatic exposure function doesn't, so the camera has to be returned for repair--again. Fortunately, this loss does not prevent us from using the camera in low light, such as you find underwater, so the repair can wait until the summer is over. Actually, the heading is misleading. 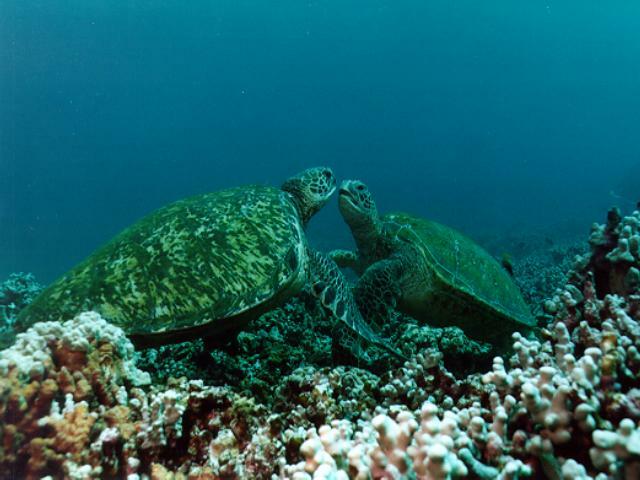 We see lots of turtles but there are several Honokowai regulars--key players--that still haven’t shown this summer. With less than three weeks left, we worry that we might not see them at all this year. Turtles we have known since 1991 or 1992 and seen every year until now simply aren’t around. Some can be explained. Tiamat is almost certainly making her first migration to the French Frigate Shoals--the primary nesting site for Hawaiian green sea turtles. Certainly for the males Goofyfoot, Estrelita, and Hilu, this might also be a possibility; however, according to George Balazs, males leave at the end of June and take 20-25 days to return to their home turf. This means we can still hope to see them this year. Where is Raphael, whose tumors had improved so significantly last season? What of 91-10--left blind with her bout with fibropapilloma tumors? 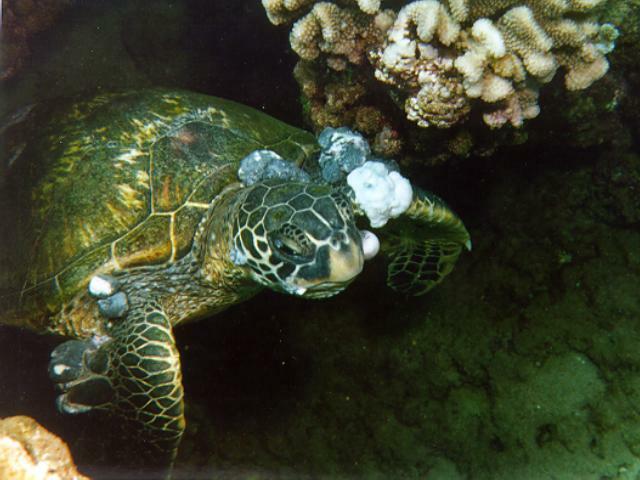 Most likely, another victim of the disease, since not many turtles can survive for long without sight. This summer, more people than in many years have snorkelled and even dived this area we call our dive site. Within easy snorkelling live two small turtles, both victims of fibropapillomas. One turtle, Polzbarney has lived here since 1995 and is now showing small but definite tumors on her shoulders. The other youngster (1997 Turtle 18) is an advanced tumor case. It is unlikely the turtle will survive long enough to be around next summer. The other youngster (1997 Turtle 18) is an advanced tumor case. We find it particularly sad that, for many people visiting either here or other areas in West Maui, the first sea turtle they ever see has tumors. Instead of a happy, inspiring sight, these tourists set eyes on the sick and afflicted. They squabble over resting places. Despite the ugliness of disease, the turtles somehow maintain their grace, their dignity, and their beauty. After all, they don't know that they aren't supposed to have tumors. They simply carry on their lives as best they can. They eat, they sleep, they mate, they squabble over resting places. Most impressively, they inspire.